After a thorough examination of several squirrel-proof bird feeders, we’ve found that the best squirrel proof bird feeder is the Droll Yankees DROFLIPPER squirrel-proof bird feeder. This feeder is battery powered (rechargeable) and is designed so that when a squirrel steps on the perch, the food ports close and the perch spins around, throwing the squirrel off the feeder. Endless entertainment, who needs YouTube?! The DROFLIPPER can fit five pounds of seed and is covered under a lifetime warranty against squirrels. It’s the best squirrel-proof bird feeder on the market. For further information on the DROFLIPPER feeder, see the Product Reviews section below. In second place on this list is the Brome Squirrel Buster Wild Bird Feeder. 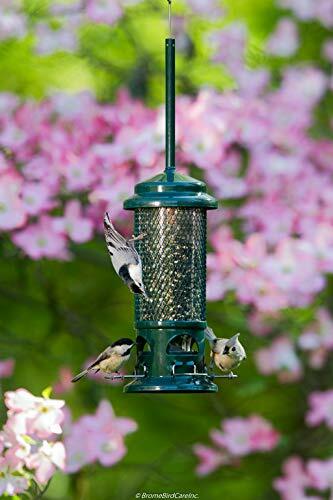 This feeder is stable, durable, and easy to set up. It comes with a warranty and replacement parts are easy to get. The product keeps out squirrels and large birds while allowing smaller ones to reach the feed inside. The weighting mechanism is adjustable, so you can configure it for your local environment. Considering the feeder is inexpensive, it’s a great choice for those who don’t want to spend a mint. For details on the Squirrel Buster, see the Product Reviews area below. Finally, a great budget choice is the Stokes Select Squirrel-X Squirrel Proof Suet Bird Feeder. 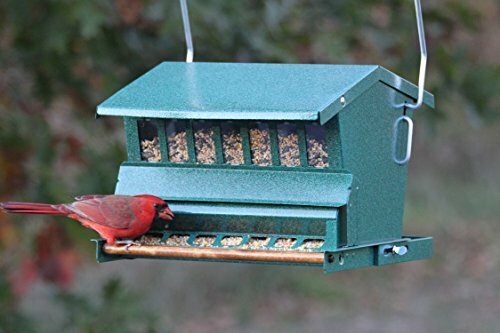 This feeder is the least expensive on the list but still manages to be durable. It takes seed and suet cakes instead of loose feed, and part of the price is donated to bird habitats, making it great for individuals who worry about the environment. It’s pretty easy to use, making it a good choice for people who want to attract birds but don’t want to spend too much money. See below for the details on the Stokes Squirrel-X feeder. Bird feeders, along with bird baths and bird houses are very helpful bird-care boxes and can help keep birds alive over winter and keep birds healthy. Be sure to check out our article on how to hang a bird feeder to go over the best practices for bird feeder placement and care. Note that it’s very important that you regularly clean your feeder, as unclean feed can lead to pathogens that can cause birds to die. Once you’ve got the basics down, it’s time to turn your bird feeder into an impenetrable squirrel-proof bird fortress! Let’s discuss how to do so here. Keeping squirrels out of your modern bird feeder can be an exercise in futility if your squirrels are anything like the ones around our area! They are clever, study this stuff for years, and are smart enough to get around many systems. Squirrels take lots of online classes in bird-feeder cracking. Birdseed can get expensive, especially if the squirrels are chowing down on it. Additionally, all that seed the squirrels eat means less seed for the birds. This is why it’s quite helpful to have a squirrel-proof bird feeder. The first place to start to squirrel-proof your bird feeder is to ensure that you have a squirrel baffle in place if the feeder is a hanging feeder or a pole feeder. This will make it much more difficult for the squirrel to gain access to the feeder to start with. From there, you can use a squirrel-proof bird feeder to further harden the feeder against unauthorized intrusion. There are two main avenues you can take when trying to stop squirrels from getting into your feeder. You can use a cage that surrounds the feeder, or a weighted system that light-weight birds can perch on, but heavy squirrels cannot. Cages surrounding bird feeders work exceedingly well at keeping squirrels out of the feeder but allowing smaller birds though. These systems are pretty reliable and generally work well. However, if the squirrel does manage to get through the cage, it can get stuck, and then you have to deal with a freaked out squirrel trapped in your bird feeder. 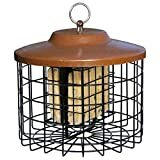 Nuttery Bird feeders are popular cage-designed feeders. This doesn’t happen often, but it can! Weighted systems work quite well at keeping squirrels out. Generally, the perches have a little weight system on them that smaller birds are too light to trigger, but squirrels and larger birds will trigger. This will cause the food ports to close up, preventing the squirrel from actually getting any food from the feeder. Depending on how the feeder is mounted, squirrels will sometimes thwart these systems by gripping various points on the feeder that don’t engage the locking mechanism, and they can occasionally get through these mechanisms. The food ports are the areas of the bird feeder that are open to seed. If the food ports are made of plastic, squirrels, chipmunks, and the like may be able to chew through the plastic in order to make a larger opening, ruining the feeder and making you extremely frustrated. If the food ports are made of metal, they are generally much more robust and will be harder for squirrels to get through. Bird feeders typically dispense either suet cakes or bird seed. In this article, we discuss bird feeders that are compatible with both options. You need to consider placement of the bird feeder both for bird access and for people access! You’ll need to regularly refill your feeder, so place it somewhere you can get to, but cats, squirrels, and other animals have difficulty reaching. As we mentioned in our how to hang a bird feeder article, it’s very important to properly clean your bird feeder on a regular basis to ensure no pathogens get spread throughout your bird population. To clean your feeder, you’ll need to keep it in an easily-accessible location. Squirrel proof bird feeders are generally placed either by hanging them on a tree branch or other object or by placing them on a pole. Either method works pretty well, as long as you use a squirrel-baffle to aid in hardening the feeder against theft. Bird feeders are great for attracting songbirds to yards, helping the local ecosystem, and adding decoration to homes. However, the food inside is attractive to other creatures, especially clever pests like squirrels. Squirrels can be a major nuisance because they are destructive, creative, and can absolutely ruin any feeder through their wiles. To prevent this, companies are now creating squirrel proof bird feeders designed to stop this destruction. In this section, we’ll look at six great options for squirrel-proof feeders. We’ll start with a comparison table to get oriented, and then dig into the details on each of the options. We’ll conclude with our favorites. Product Dimensions: 9 x 9 x 15.5 in. 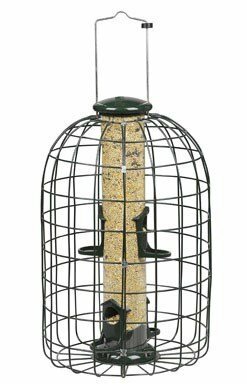 The Audubon Squirrel Proof Caged Tube Type Bird Feeder Model NATUBE3 (Audubon Squirrel Proof Bird Feeder) is a tough, durable feeder. It’s constructed of a plastic tube hidden within a large, powder-coated steel cage that prevents squirrels, chipmunks, and large birds like grackles from getting inside. There is a hanging mount at the top of the feeder that can be attached to a pole or nails to change the method of location. Should you choose to hang it, you’ll get much more squirrel-resistance by adding a squirrel baffle. The main tube has four feeding troughs for smaller birds like finches. A warranty is available for the Audubon Squirrel Proof Bird Feeder from the manufacturer. This feeder can hold 1.25 lbs. of mixed seed or small shelled nuts, and which is a fairly small seed capacity for a bird feeder at this price point. Cleaning of the Audubon NATUBE3 is pretty simple, and the whole system comes apart easily. The interior tube can be removed and cleaned before refilling. The NATUBE3 is a pretty effective squirrel-proof feeder, all things considered. However, the construction isn’t the greatest since the plastic sections can be bitten and torn through by a persistent squirrel. Additionally, the two sides of the cage are formed separately and then welded together to create the enclosure. At those weld points are a few spots that a bird can get caught on and trapped by. This is obviously not ideal! Some buyers have also had issues when trying to use the warranty, which is a concern as well. The Audubon Squirrel Proof Bird Feeder is a durable, compact bird feeder that holds 1.25 lbs. 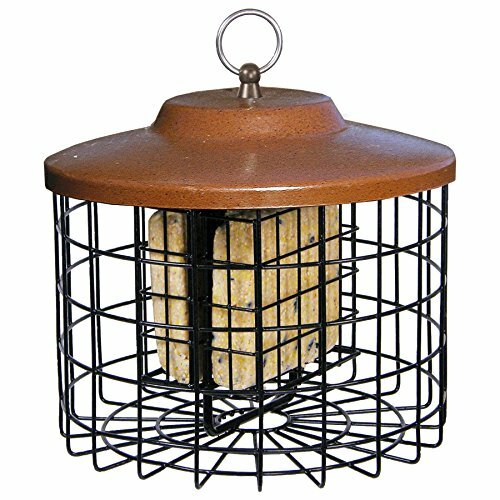 The product works best for small birds and includes a cage around the plastic feeder. It’s effective at keeping squirrels and larger, more destructive birds like grackles out of the feeder. The presence of a hanging mount is great and the product is not terribly expensive. That said, there it’s small for its price point, and there are a few quality conerns. For these reasons, the Audubon loses out to the Brome and Roamwild. The Stokes Select Squirrel-X Squirrel Proof Suet Bird Feeder is a smaller feeder designed to hold seed-and-suet cakes instead of loose seed. The Squirrel-X takes the form of a cage nested inside another cage. The system features a broad roof and baffle to keep out squirrels and large birds that might steal all of the food inside. It is colored a moderate brown to be more attractive to songbirds and is weatherproof. The design primarily consists of slick powder-coated steel. When individuals purchase a Stokes Select feeder, part of the cost is donated by the manufacturer to bird habitats and conservation centers. This product has four feeding ports and an open design to better filter air to the food and keep it fresh and attractive. The inner cage can hold up to 2 suet cakes. The empty feeder weighs roughly 2 lbs, and each suet cake is about 1 lb. The Stoke Select Bird Feeder is an extremely easy model to clean and includes a hanging mount that works on poles and nails. The Stokes Select Bird Feeder is the only one on our list that holes seed-and-suet cakes as opposed to standard seed mixes. The design is simple, durable, and easy to use, and the feeder is one of the least expensive models on the market that is still effective. The Stokes Select doesn’t come in at the top of this list because it’s rather small, but it’s a great option for someone on a budget, making it our choice for individuals who want something reliable but don’t who want to spend too much. Product Dimensions: 28.5 x 10 x 10 in. The Droll Yankees DROFLIPPER Squirrel-Proof Bird Feeder is an environmentally friendly, extremely durable bird feeder made of metal and polycarbonate. The product is UV resistant and also battery-powered, which is unusual to see in a feeder. 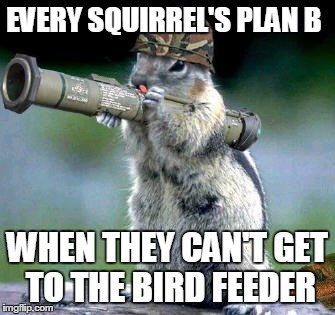 The feeder manages to efficiently deliver seed and food to four separate ports which are difficult for squirrels, chipmunks, and other rodents to reach. Should a heavy object put weight down on the supports, the feed ports will close (battery operated) and the support will spin around, causing the squirrel to fall off. Here’s a short video that shows the experience. This feeder will feed the birds, and also give you huge satisfaction each time you see a squirrel dizzily tumble to the ground after taking a spin on the bird feeder. The Droll Yankees Squirrel Proof Feeder can hold up to 5 lbs. of feed and weighs roughly 9 lbs. when empty. This feeder is available in multiple colors and even several different styles to suit varying environments. The materials used are environmentally friendly and can be replaced with parts ordered from the manufacturer. The entire product is made in the United States and remains durable and efficient. And the whole thing is covered under a lifetime warranty against squirrels! Just be sure you check the batteries from time to time. They typically last for about 1 month over the summer before they need to be recharged. The Droll Yankees Squirrel Proof Feeder is an amazing option and difficult for squirrels to crack, but it is on the expensive side. On the other hand, you do get the comedic value of watching squirrels fly off of your feeder, which definitely makes up for the price difference. And the lifetime warranty is huge, as is the 5 lb seed capacity! The DROFLIPPER is the best squirrel-proof bird feeder in so many ways. Product Dimensions: 16.5 x 7.6 x 7.6 in. 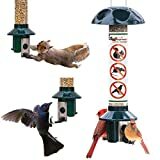 The Roamwild PestOff Squirrel Proof Bird Feeder is a professional grade bird feeder made out of metal with a plastic bottom for easy access for cleaning and care. The top can be opened and then latched shut to replace bird feeder simply and easily. The Roamwild is designed to be weatherproof and waterproof so the seed inside doesn’t get damp and clump up or rot. A warranty is available upon purchasing, lasting for roughly 1 year. The Roamwild bird feeder includes a weight-based closing mechanism that can be reset by the user. This mechanism comes preloaded for the weights of adult and baby squirrels and primarily works for red and gray squirrels. It’s also designed to be resistant to chipmunks. This feeder holds 3 lbs. worth of seed and primarily works with mixed seeds, sunflower hearts, and safflower seed. There is some basic UV radiation resistance to prevent discoloration. The Roamwild bird feeder is a long, thin bird feeder that works well for homeowners who want something small and light for their yards. It has multiple solid qualities like an included warranty and locking top, but also has some negatives. For example, the material is not chew-proof, which can pose a major problem if the pests figure out how to nibble through the plastic on the bottom of the feeder, which has happened. Some individuals might also be annoyed that they can’t adjust the weight mechanism to handle heavier or lighter animals. NOW ALL METAL & NOW WITH A BIGGER 3LBS CAPACITY - 21"x 8 "x 8" (w/hanger) - NOT JUST A 100% SQUIRREL PROOF BIRD FEEDER - ALSO BABY SQUIRREL PROOF, red squirrel proof, chipmunk proof bird feeder, and LARGE BIRD PROOF. Pests cannot feed so it SAVES you money! Roamwild PestOff Warranty Included. Watch the feeder in action vs a squirrel below, click on - 'PestOff Squirrel Proof Bird Feeder in action in the 'RELATED VIDEO SHORTS' below. WEATHER PROOF & WATERPROOF - KEEPS SEED DRY & FRESH - The PestOff bird feeder has a built in weather guard to keep the seed fresh and dry to prevent seed clogging. Seed clogging is a common problem with other weight activated bird feeders that have no seed protection. 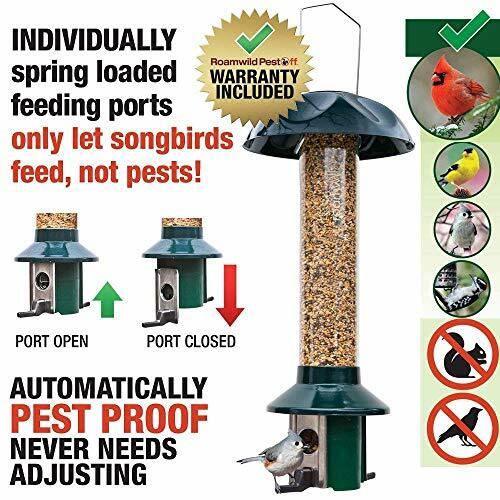 NO SETTINGS TO ADJUST - AUTOMATICALLY PEST PROOF - The PestOff bird feeder has INDIVIDUALLY spring loaded perches that never need adjusting, it is ready to go straight out of the box. 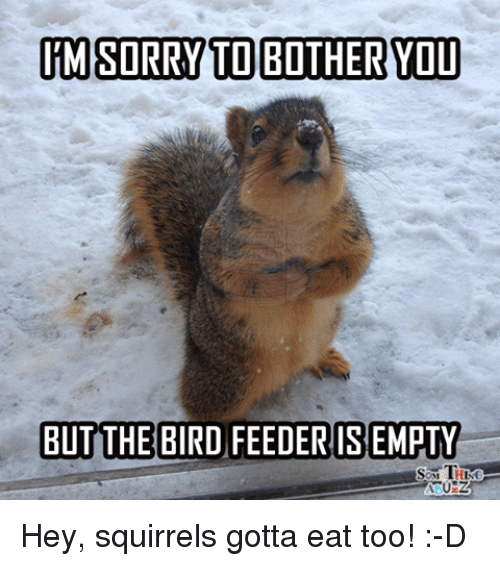 This also prevents the feeding ports closing when too many birds try to feed from the feeder at the same time, a common problem with single mechanism weight responsive squirrel proof feeders. SO SIMPLE TO USE AND FILL - Simply open the lid and fill. No need to take the whole feeder apart to fill. The PestOff bird feeder simply 'clicks' apart for easy cleaning, no nuts and bolts to remove and replace. Seed container is made from thick UV stable Polycarbonate. VERY LARGE capacity 3LBS so no need for constant refilling. Ideal for feeding sunflower hearts, safflower seed or any mixed seed mixes. Woodpecker & Cardinal friendly. Hassle Free Warranty. If you are not 100% satisfied we will give you your money back. Roamwild PestOff Warranty Included. 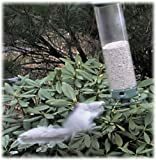 Watch the feeder in action vs a squirrel below, click on - 'PestOff Squirrel Proof Bird Feeder Working' video in image section of this page. Product Dimensions: 5 x 5 x 21 in. The Brome Squirrel Buster Standard Wild Bird Feeder is a reasonably sized feeder designed to keep squirrels out. It accomplishes this with a well-designed adjustable weight mechanism. This means the owner can set the level where the weight causes the lid to close over the food troughs. You’ll be able to tweak the settings for your individual micro-environment, which is a great solution! There are four food openings at the bottom, and the feeder best accommodates small seed mixes, some millets, and shelled nut foods. The Brome Wild Bird Feeder is meant to feed species like cardinals, chickadees, finches, blue jays, and some woodpeckers. This squirrel resistant bird feeder weighs roughly 1.5 lbs. and is made of green plastic and metal. The material is UV resistant to prevent discoloration and the gradual breakdown often seen from sun exposure. The materials are also designed to be bite and chew-proof so squirrels can’t eat their way through to the seed. No tools are required to set up or take apart the feeder. Additional seed ventilation is included in the design so seed stays fresh but doesn’t get wet from the rain, and the whole system is pretty easy to take apart and clean. A hook is included at the top as a hanging mount, although the Brome Wild Bird Feeder does work when hanging off of poles as well. If you decide to hang it, be sure to combine it with a squirrel baffle for further protection. The Brome Wild Bird Feeder comes with a lifetime care and repair guarantee from the manufacturer, meaning it can always be sent in to be fixed. The Brome Wild Bird Feeder is our runner-up choice due to its thoughtful design, simplicity, price, and lifetime warranty. The feeder is lightweight and fairly inexpensive, and it looks great. Though its a little on the small side, all of these factors put the Brome feeder in our runner-up spot. Full Product Dimensions: 13.5 x 16 x 11.2 in. 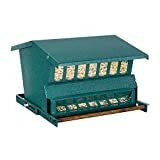 The Woodlink Absolute Squirrel Resistant Bird Feeder Model 7533 (Woodlink Bird Feeder) is a high-capacity squirrel resistant feeder that looks like a small house made of steel. 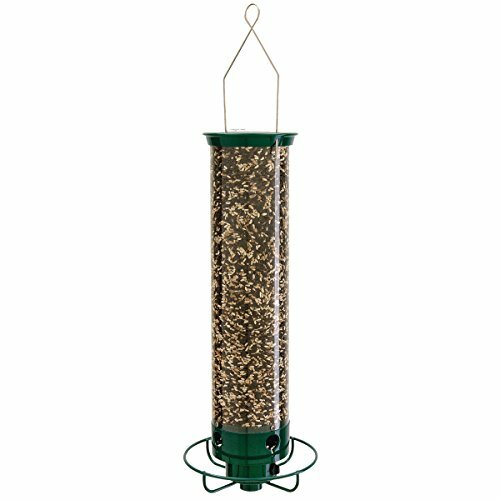 The bluish-green feeder has one opening on the side and comes with a metal hanger and a 5 ft. pole covered in powder for a slippery service. Owners can choose whether they want to hang it or use the pole to set the feeder up in the yard. 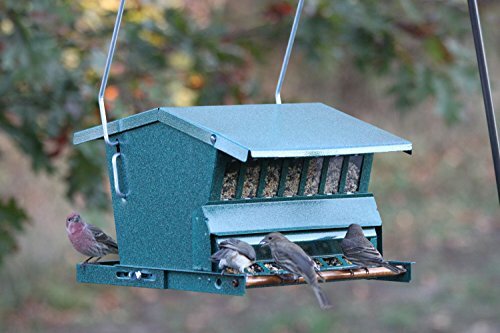 The feeding tray is adjustable for small, medium, and large birds. 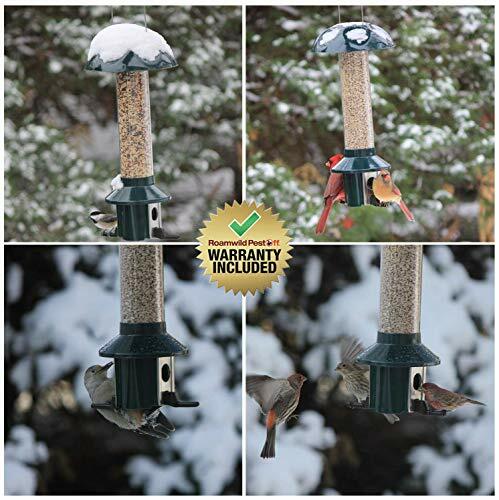 The Woodlink Bird Feeder is weight-responsive, which means it slides shut whenever a creature over the set weight limit sits on the feeder. The top locks so squirrels can’t pry it open and get the delicious food inside. The product holds roughly 15 lbs. of seed or feed and works best with mixed seed, sunflower seeds, peanut halves, or safflower. The entire product is made in the United States and does have a warranty available. The Woodlink Bird Feeder is a sturdy, durable model that lasts for a long time and can be hung or sit on a pole. Its main problem is that it’s a bit on the expensive side, which could be an issue for those who don’t want to spend a ton of money on a bird feeder. Also, the weight mechanism can be a bit faulty, especially if the birds are too heavy. For these reasons, the Woodlink doesn’t quite measure up to the Brome or the DROFLIPPER. Squirrels can be a nuisance, but they’re not the end of the world. It’s still possible to feed and care for songbirds without having to worry about the rodents’ destruction. How? Investing in a squirrel proof bird feeder. Out of all of the products reviewed here, the first, second, and budget picks were the DROFLIPPER, Brome, and Stokes Select. Each one is difficult to crack, easy to fill, and all around attractive to birds. Don’t let the squirrels ruin the day; it’s time to set up the feeder and let the birds play!